So the other day I'm stuck on hold with the insurance company and I was just making some marks on a paper. Well no true tangler ever "just makes marks", right? Soon a new tangle appeared. I thought it was pretty cool but didn't go much further with it. The next day the husband and I were sitting in a restaurant and I was trying to come up with a tangle to commemorate the Giants games we were headed to (Woo hoo!!!! Go SF Giants) and I decided to show the hubby the new tangle I had come up with the day before. He looked at it and then said "You know what that looks like, right?". He then went on to tell me that he thought it resembled a ummmm.... lady part. I guess I could see what he was talking about but didn't give it much thought. The next day I was working on some tiles at work using my new tangle and two employees came in and without any prompting, both commented on my new lady part tangle. Well geez, what was I to do now? I couldn't put this anatomical folly out into the blogosphere. I needed a new focal point. The next day I went to work a medical standby at a local music venue. 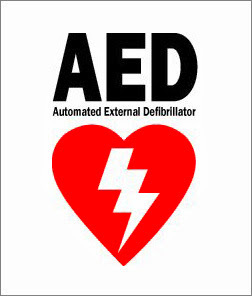 Near where I sit is an AED (Automated External Defibrillator) and there was a sign above it that looked just like this. There it was. The sign, both literal and figurative, that I had been waiting for. This lightening bolt would be perfect for my new tangle. A tweak of the name and a step out and Dephib was born. Since we are talking about AED's I'd like to take this opportunity to do a little educating. In case you don't know, an AED is a medical device that can be used by anyone to help fix an electrical abnormality in someones heart. Many people believe that defibrillators are used to "jump start" the heart and fill it with electricity when it isn't working properly, but actually it's kind of the opposite. Here's how it works. The heart is a muscle. Through a very complex system the brain sends a signal to the heart cells telling them to combine certain electrolytes (sodium, potassium, calcium, and magnesium) and generate a tiny electrical charge that causes the heart muscle to contract. These contractions are what we feel on our wrist or neck as a pulse. These electrical impulses work on the heart in several different places creating an electrical "rhythm" that causes the heart to beat properly and allows blood to travel through the body. Sometimes this rhythm gets out of sync. This can be caused by stress, disease, caffeine, drugs, alcohol, and many other reasons. Many times we feel it as a harmless "butterfly" in our chest and the heart goes back into rhythm. This is very common. Sometimes however the heart rhythm becomes so disorganized it just "quivers" or fibrillates. When it happens in the top of the heart we call it Atrial Fibrillation. Many people have this condition and it is easily controlled with medication. When it happens in the lower part of the heart it is called Ventricular Fibrillation and this can be deadly. A defibrillator is used to nullify all the electrical activity in the heart and stop the "quiver" in the hopes that the heart can then recover and reset it's original rhythm. Unfortunately, sometimes a patient's heart has been damaged to the extent that no electrical activity exists when the paramedics arrive so defibrillation is not an option. So why the anatomy and physiology lesson. Because it's important to understand how sudden cardiac death can occur and that you can be an important part of saving someones life. If you are able to become AED certified, please do so. It is now offered with most CPR classes and since AED's are being placed in more and more public places, you may be able to actually save a life. I recently participated in an event where my company set a world record by training as many people as possible in Hands Only CPR in one day. In Sonoma county alone we were able to train over 1,000 people! I hope you enjoy the new tangle and if available learn to use an AED. Please pass the videos around and encourage your friends and family to learn Hands Only CPR. I hope you will never need to use it but you will be glad you did if the situation ever arises. Love it! It has humour and warmth. Thank you for sharing. I also want to thank you for sharing this tangle. I like the way it's bold and soft at the same time. 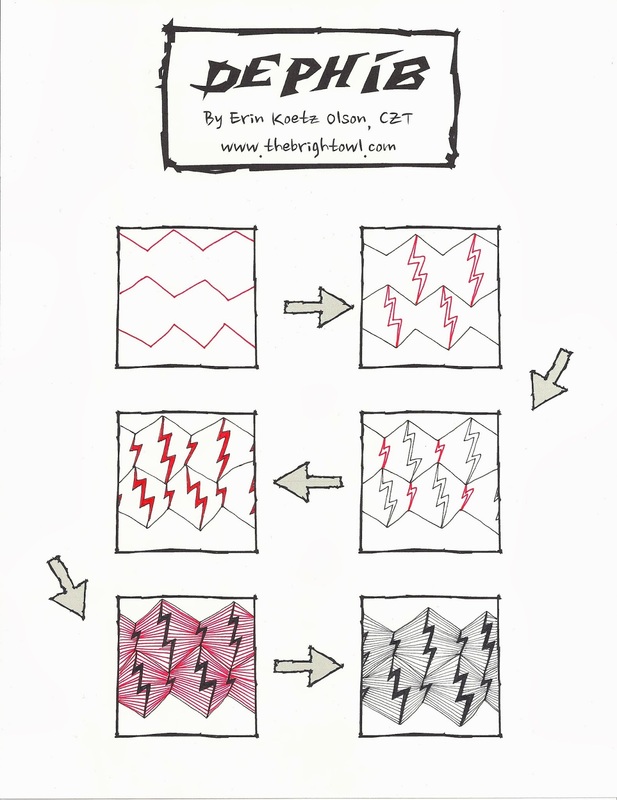 Thanks for the great template, Erin, and many thanks for the information on Atrial Fibrillation. I had a really bad time early last year when that complaint was diagnosed, but fortunately, all the tested showed that my heart was undamaged and I can live with the medication. I don't think I've ever been as scared of anything before, having enjoyed good health and sung opera for nigh on 40 years, and I'm so grateful for the wonderful way they helped me at the hospital. I can't express how much I admire you and all your colleagues who dedicate their lives to the welfare of the sick and injured. Oh, this post made me giggle. I can only imagine what you were tangling....all innocent at the table...not realizing what you were doing. Just delightful story. (I know this is two years later, but your work is featured in the Suzy Mosh challenge this week, and that is what brought me here) Fun stuff!